I have unfixed, fresh frozen horse muscle and unfixed, fresh frozen pig muscle I would like to label with anti-SNAP 25, anti synaptobrevin and anti syntaxin for ICC/IF to investigate the neuromuscular junction. 6 micron sections on slides. – stored at -80 Which primary and secondary antibodies would you recommend? I have tried: ab53723 rabbit polyclonal anti-SNAP25 ab11104 mouse monoclonal anti-synaptobrevin (VAMP) ab3265 mouse monoclonal anti-syntaxin but have had no success. I was doubtful of my secondary for the above so which would you recommend? The antibodies above were sent to me by colleagues who has successfully used them on paraffin sections with a labelling kit. I routinely use bungarotoxin to identify the junctions. Thank you for contacting us. I am sorry to hear that you are having problems with the 3 antibodies ab53723, ab11104 and ab3265. 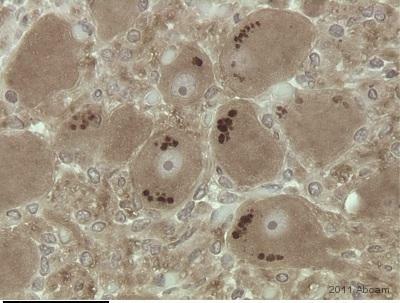 Unfortunately, ab53723 has not been tested for IHC-Frozen, horse and pig samples. Also, ab11104 has not yet been tested in IHC-Frozen and horse samples. It is the same situation for ab3265 which has not yet been tested for IHC in general as well as horse and pig samples. (We refer to fresh frozen tissue as IHC, and to cultured cells as ICC/IF). Thus, we do not know if and how well these antibodies would perform for the application/species used. The correct seconday antibodies would have been an anti-mouse secondary for both ab3265 and ab11104, and an anti-rabbit secondary for ab53723. What fluorophore have you been using? What exactly was the problem that you encountered for each antibody? And what antibody dilution, blocking and detection step did you use? Please let me know. Also, it might be advisable to use a fixation step to ensure the proteins are kept in the correct location. Was a permeabilization step included? The crossreactivity of an antibody depends mostly on the sequence homology between the immunogen and the protein sequence of interest. Do you have the horse and pig sequences for all 3 proteins? That way I could check which antibody might be most suitable for horse and pig samples. I checked the antibodies we currently have in the catalog: For Syntaxin, we have 4 other antibodies that have been tested with pig samples: ab113986 (FITC), ab112200 (biotin), ab112198 and ab24731. But none of these have been tested in IHC or with frozen sections or with horse samples. For Synaptobrevin, we have 3 other antibodies that have been tested with pig samples: ab24735, ab18015 and ab18013. Again, none of these have been tested with IHC or horse samples. For SNAP25, we have ab24732 that has been tested with pig samples, ab117083 that has been predicted to react with pig samples. None of these however were tested with horse or IHC-Fr samples. We have also 4 antibodies that were tested in frzen sections (IHC-Fr), but not yet in pig or horse: ab68859, ab72396, ab68858 and ab72394. For UNTESTED species and/or applications, we have established a testing discount program. Here is a brief description of how it works: The testing discount program is for customers who like to use an antibody/protein on an untested species/application. You would purchase the antibody at full price, test it and submit an Abreview with your data (positive or negative). On your next order you will receive a discount for ONE antibody at the full price (100%) of the antibody you have tested. The terms and conditions applicable to this offer can be found here: https://www.abcam.com/collaborationdiscount. As for secondary antibodies, the choice depends on the host of the primary antibody (e.g. for a rabbit-raised primary antibody, the secondary shuld be an anti-rabbit) as well as what conjugation you prefer to use or which detection system is available to you (e.g. which wavelength can be detected). I look forward to hear back from you with more details so that I can assist you further. Thank you very much for your patience. Product ab3265 is raised against Syntaxin 1 of rat origin. Since there are only 2 amino acids that fall within an extracellular region, the chances of Syntaxin 1 (HPC-1) mapping to this region are quite low (very low). However, because we do not characterize the exact eptiope of this antibody, we cannot guarantee the exact region the antibody maps to. I have updated the datasheet. I apologize for the inconvenience. I hope this information will be helpful. Should you have any other question please do not hesitate to contact me. Thank you for your e-mail. How did you get the data that the epitope resides in the extracellular domain of the protein? Is there any reference about the epitope resides? Thank you for your help. Thank you for getting back to me. The details of the epitope region (extracellular) are provided by the source of this antibody and is shown on the datasheet. Please see the link below. I hope this information helps. Please do not hesitate to contact me should you require further assistance. What epitope (amino acid sequence) does the syntaxin monoclonal antibody recognize? Thank you for your enquiry. I am sorry but the epitope sequence ab3265 remains proprietary. I can however tell you that the epitope resides in the extracellular domain of the protein. I hope this information helps. Please do not hesitate to contact me should you require further assistance. I need a syntaxin antibody to label amacrine neurons in mouse retina. I would like to know if the ab3265 cross reacts with mouse. thanks. Thank you for your enquiry. All the information we have on species cross reactivity is specified on the datasheet. To our knowledge, cross reactivity with mouse has not yet been tested. Should you decide to go ahead and purchase this product, please let us know how you get on and in return we will forward a reward of your choice, typically an Amazon gift voucher.